It is Wednesday morning and I’m bubbling with excitement, or at least as much as I can bubble before my first latte of the day. My friends the Clevelands are landing in a few short hours, here for their first visit. I’ve known Brad since he and I met in three-year old preschool and I was a groomsman at Brad and Donna’s wedding. Along with their children, 10-year old E and 8-year old C, they’ll be here for five days before they head to China. It is just like having family visit and I’ve planned a series of activities for the children, all tied into an elaborate back-story about them being top secret agents, to make the trip memorable. I’ll share more about their trip, the spy story, and activities over the next few days. Meanwhile, I thought I’d share some pictures from the dinner we had last Saturday at La Scala restaurant at the beautiful Sukhothai Hotel here in Bangkok. Paul and Nicha, Tawn’s cousin and wife whom we do not see nearly often enough, invited us out for dinner. In Thai culture, when your elders invite you (and insist on paying! ), who are you to refuse? 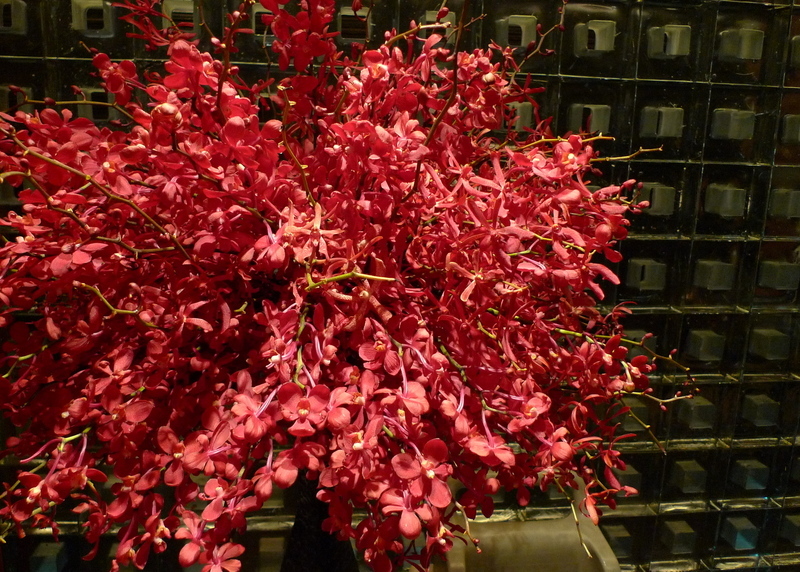 A gorgeous spray of orchids against a glass block wall at the front of the restaurant. The dining area is an interesting blend of textures and styles. Unfortunately, we weren’t at this table, but at one with less light. A large part of the kitchen is in the midst of the dining room, letting you see the action. 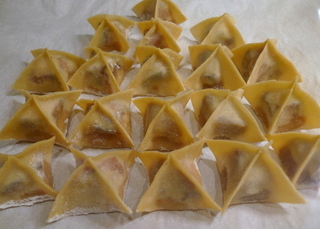 On the left are trays of homemade pasta. On the right are the homegrown mushrooms used in various dishes. 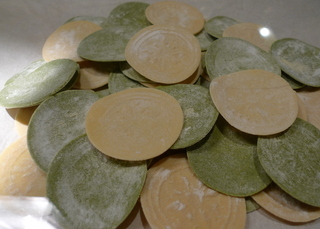 A closer look at some of the pastas! 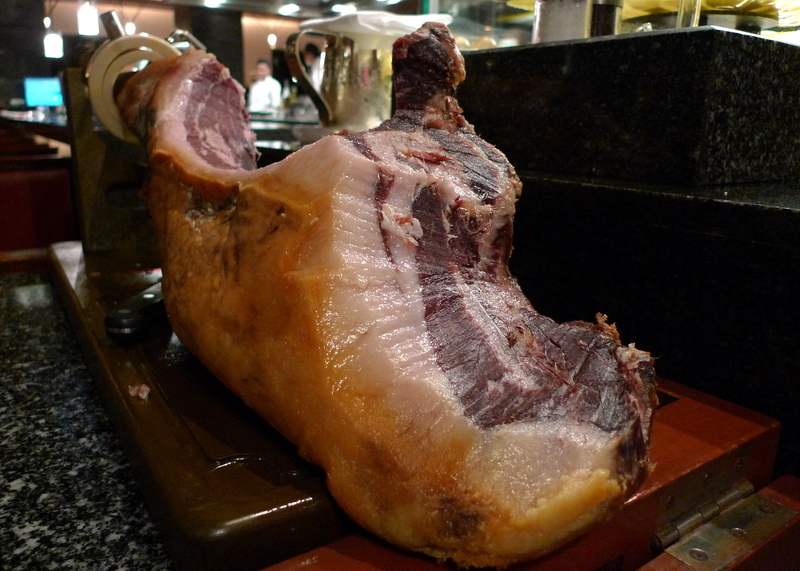 A big cured pig’s leg sitting next to the kitchen for slicing off prosciutto. How would you like to have one of these laying about for snacking? 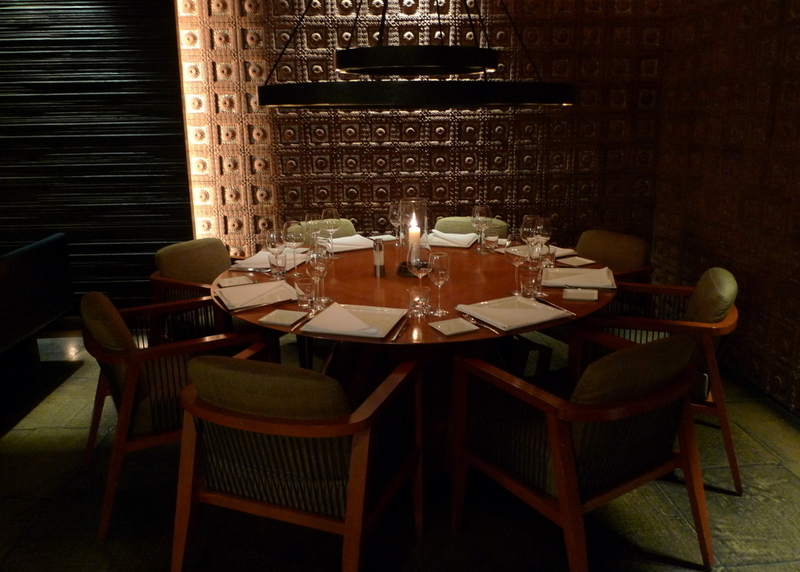 The lighting at the table was very dim, so the quality of these pictures is not great. Hopefully, they will give you an idea of what the food looked like, though. 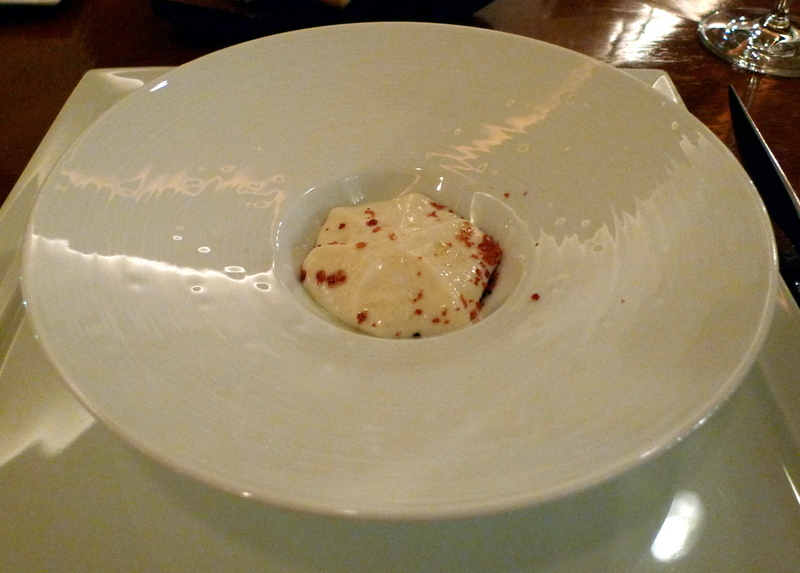 Amuse bouche of potato puree with truffle oil. Yummy. We ordered a pair of salads. 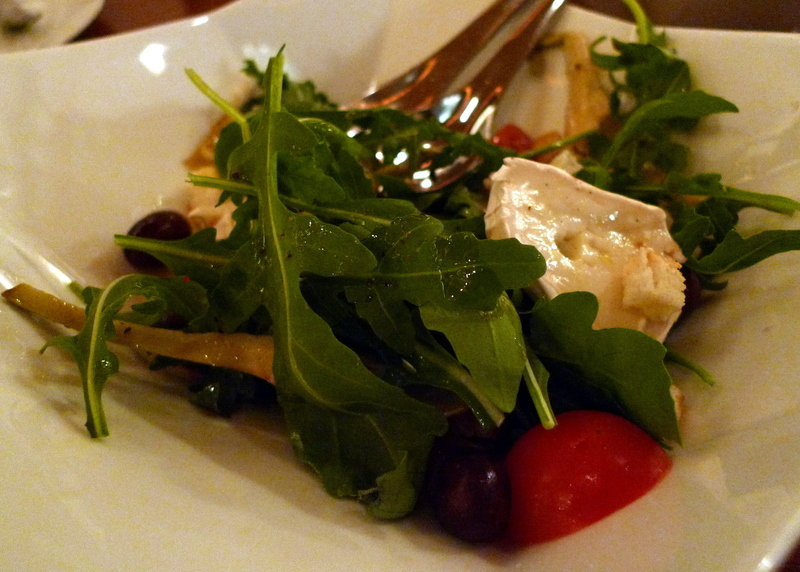 This one is the rocket salad with a balsamic dressing. Very nice. 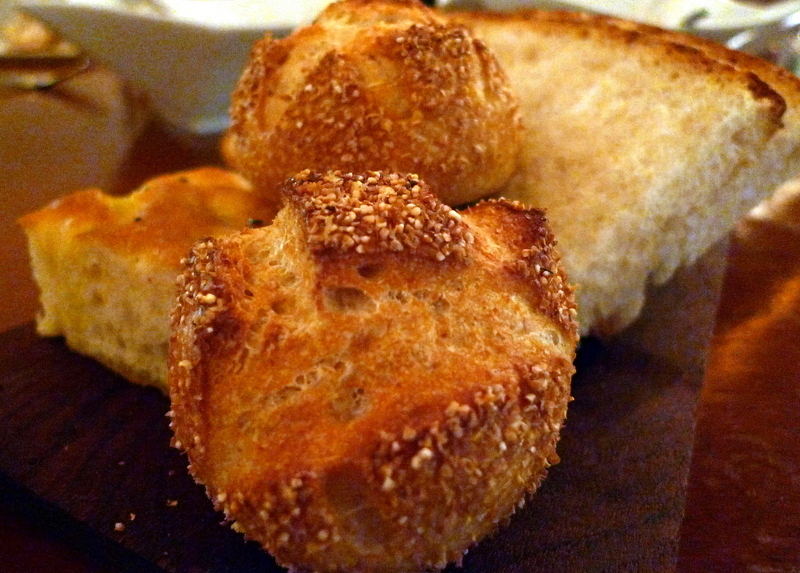 The breads were quite nice, too. The more I eat at hotels the more I realize if I want good European style breads, I probably need to buy them from the hotels. I had ravioli filled with a mixture of chicken meat and duck foie gras. 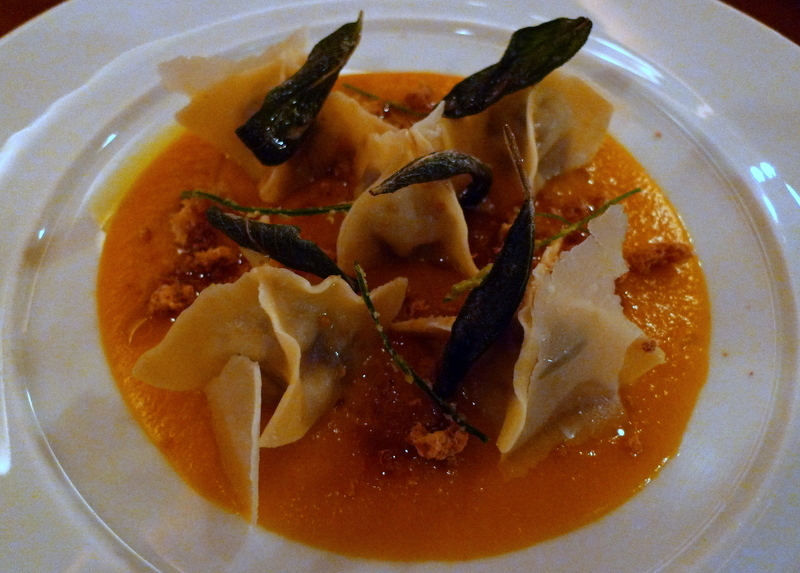 The sauce is a pumpkin puree with fried thyme leaves and candied walnuts. The dish was very tasty with some of the thinnest pasta skins I have ever had, but it was just a little too sweet for my tastes. To be fair, the waiter did make me aware that while it was a tasty dish, it was on the sweeter side. 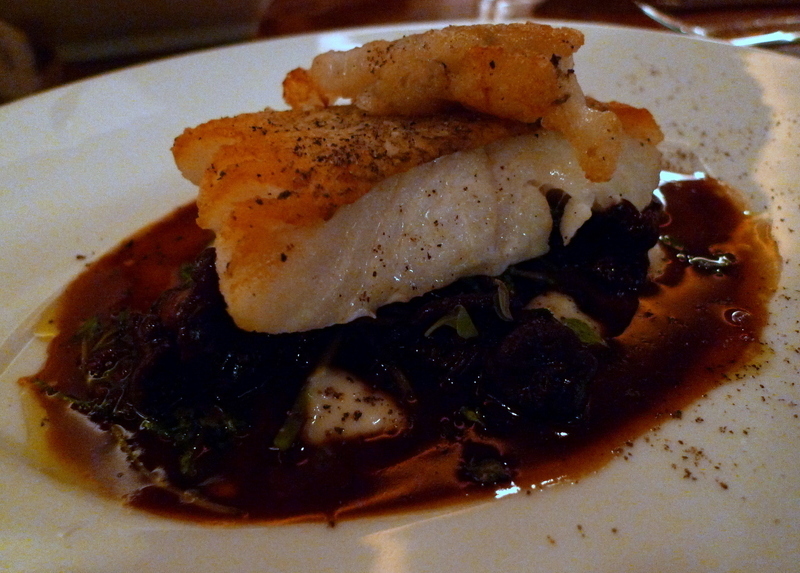 Tawn had a dish of pan fried cod served over greens and mashed potatoes with a reduction sauce made from the homegrown mushrooms. It was beautifully done. Unfortunately, I didn’t get pictures of the dishes Paul and Nicha had, both of which were pasta dishes with a slightly spicy tomato sauce, and both of which were extremely good. For dessert, I had fresh berries baked in a zabaglione sauce, topped with homemade vanilla ice cream. Yummy! Tawn had homemade gelato, including this scoop of espresso that was very rich. 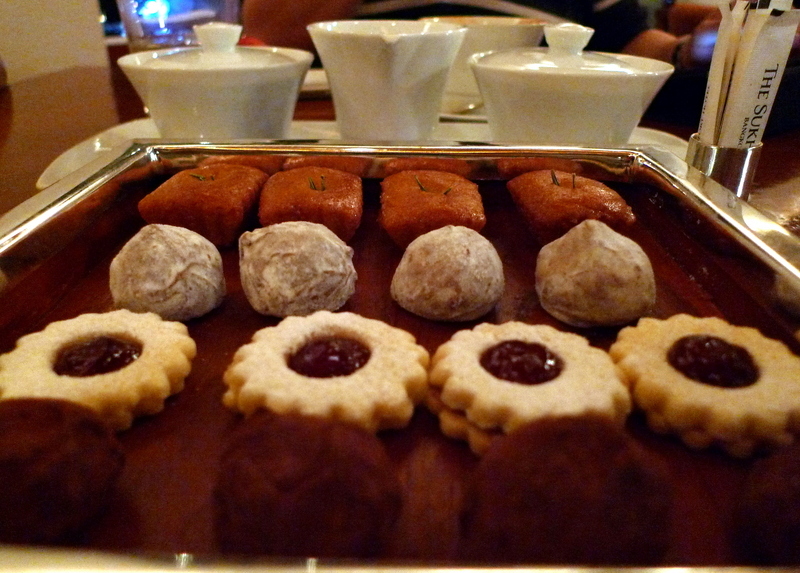 The restaurant also served complimentary petit-fours, a nice finish to the evening. 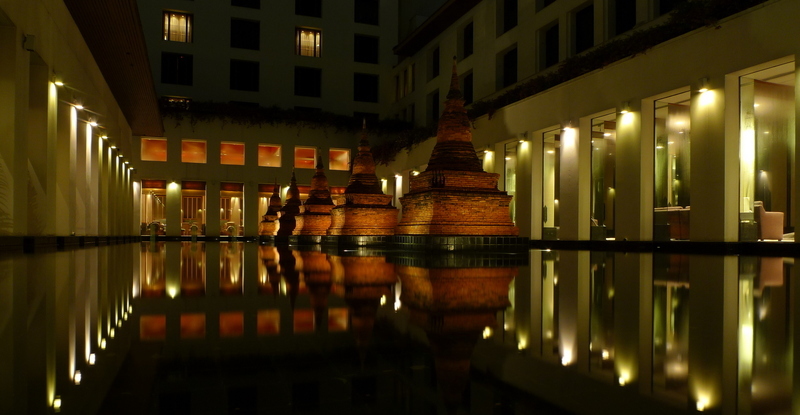 Finally, a view of the beautiful reflecting pool outside the lobby, featuring brick chedis or stupas in a pool of water. Beautiful, no? Me, Nicha, Tawn, and Paul. There’s a significant back story that I’ve written about once before but can’t find the entry right now. The short version of it is that Paul mother and Tawn’s father’s are siblings. She and her husband raised Paul and his two brothers in the US and they were the first people in Tawn’s family we came out to as a couple. They’ve been super-supportive over the years and we really appreciate it. 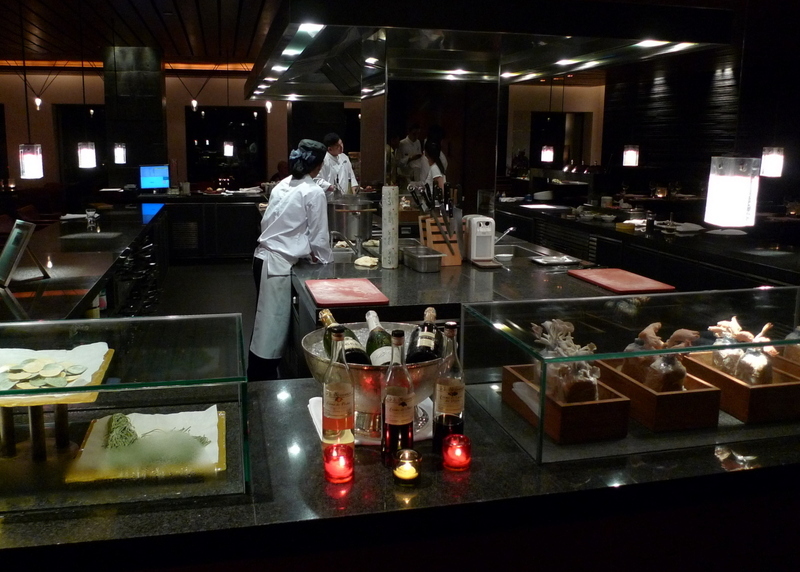 This entry was posted in Uncategorized and tagged Bangkok, Dining, food, La Scala, Nicha, Paul, Sukhothai Hotel by christao408. Bookmark the permalink. lovely food indeed ……Sukhothai I used to stay there a lot when I was visiting BKK, too bad I only had bfast there…. It all looks delicious, Chris. Have good fun with your friends and their kids — I love the idea of theming the activities for the kids! Nice fine dining at the Sukhothai! The picturesque courtyard is always so pretty! Wow! The place looks so elegant and fancy. I am so in love with the courtyard! wow, that looks like an amazing dinner. we have a la scala restaruant in baltimore, and while it is quite good, it’s definitely not on par with what you had! it’s too bad your dish was on the sweet side; i think it sounds like it would work well as a savory dish. Yes! very good, and lovely pictures. How good that Paul and Nicha are so close to you both. I bet their children adore you Chris. @agmhkg – Great hotel, isn’t it? @CurryPuffy – So are we going to get any updates from your recent travels? @kunhuo42 – I thought so, too, Aaron. 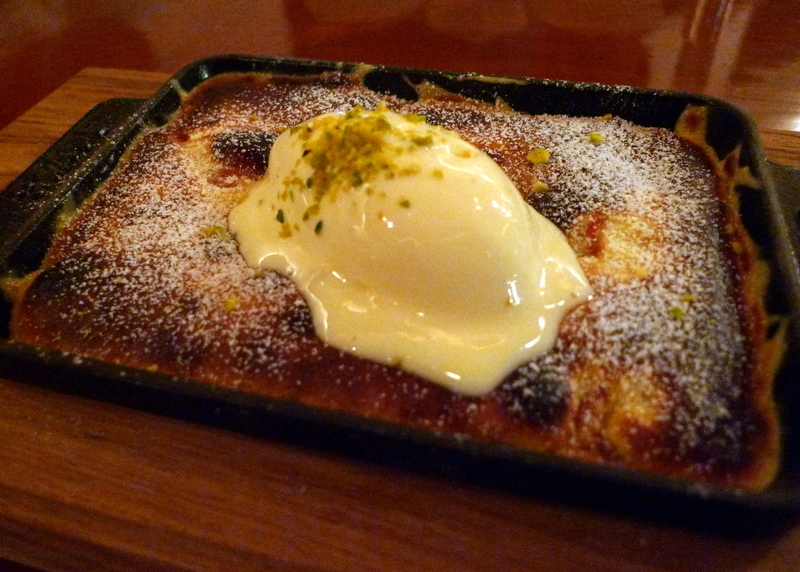 @murisopsis – It is a great combination; just a little sweet. @Dezinerdreams – The hotel is beautiful. When you come to Bangkok it is worth a visit just for a stroll around. @ZSA_MD – Actually, Paul and Nicha haven’t any children yet. I wasn’t very clear that they and the couple with children are not the same people. In either case, I’m very glad they are close. @slmret – First round of activities turned out okay, even as the secret agents were jetlagged in the early evening. @christao408 – Oops — did you remember that detail?! What a wonderful evening!!! Aren’t you glad you accepted their offer of a night out on the town??? @TheCheshireGrins – The sauce had been sweetened a bit more than expected and the filling also had some sweetness to it – maybe some apple mixed in? @Redlegsix – Always glad to accept an offer such as that. @slmret – Well, it is hard to evaluate how much sleep little secret agents need. @yang1815 – It was. It looks like a shark took a couple of bites off the pork leg. The hotel looks lovely and those orchids are amazing. 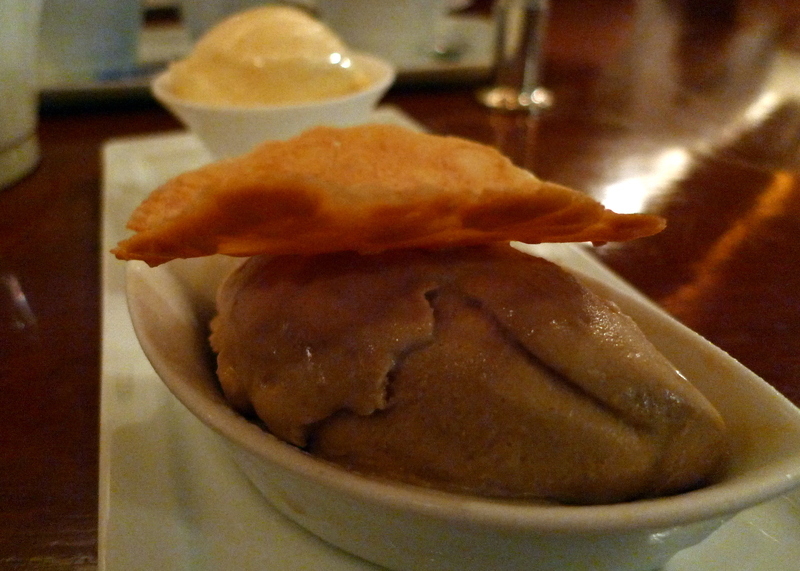 That espresso gelato – oh my, I can smell it from here. that pig’s leg looks very nice and sweet! I’m sure they slice it nice and wafer thin.